The Downtown Boston I once knew and loved was a mecca for book lovers. There was a two floor Barnes & Noble AND a two floor Borders within walking distance of each other, as well as Brattle Book Shop, one of the oldest and largest used bookstores in the country. Thankfully, Brattle still survives, but Barnes & Noble closed years ago and Borders followed last year. Both locations remain woefully vacant. 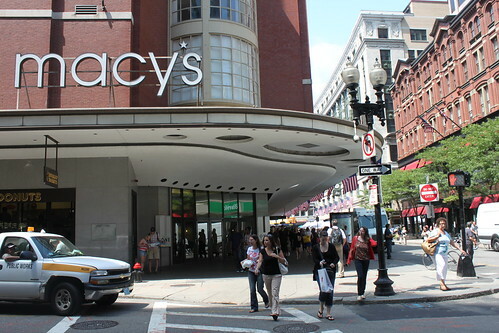 But Macy’s, a stone’s throw from the former Barnes & Noble location, may help restore Downtown to its former bibliophilic glory. The department store will be incorporating a 300 square foot Barbara’s Bookstore into its lower level. Barbara’s, which first opened in 1963 in Chicago, currently has one other location in Boston at South Station, and will soon open sections at dozens of other Macy’s locations. I am personally very excited that a new bookstore will finally be opening Downtown. Now that the Borders is gone (I was never very fond of Barnes & Noble, and vehemently refuse to buy anything from the B&N in the Prudential unless it is an absolute emergency), my bookstore options are limited to Trident and Raven on Newbury Street, and maybe Brattle if I have the time to wonder around the store. Even though the “store” is opening within an existing store, this might be the jump start necessary to finally start revitalizing Downtown Boston, which has been a shadow of its former self ever since the Barnes & Noble, Borders’, Filene’s, and Strawberry’s/FYE closed and T-Mobile, AT&T and Verizon stores started snatching up valuable real estate. Here’s hoping new tenants for all those closed locations will follow. Tagged barbara's bookstore, barnes & noble, borders, brattle book shop, downtown boston, macy's, raven used books, trident booksellers.